RoadSafe: EU goal of halving road fatalities by 2020 will now be 'very challenging'. EU goal of halving road fatalities by 2020 will now be 'very challenging'. 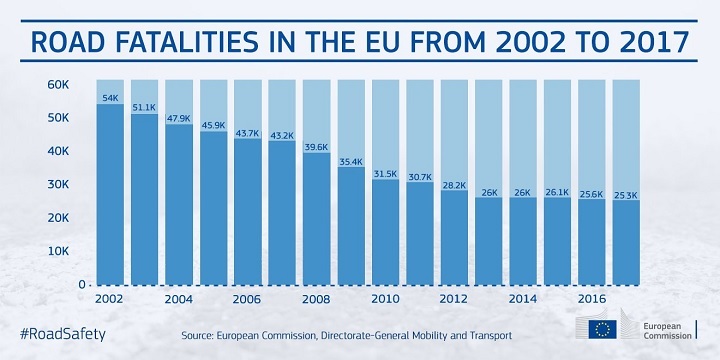 The European Commission says reaching the EU goal of halving road fatalities between 2010 and 2020 will now be ‘very challenging’, despite a year-on-year fall of 2% in 2017. In the UK, there were 27 road deaths per million inhabitants in 2017, a 5% year-on-year fall. With 25 road deaths per million inhabitants, only Sweden had a better record. The biggest decline in the number road deaths per million inhabitants came in Estonia – down 32% to 36; while the greatest rise came in Cyprus – up 15% to 62. The EC estimates that 135,000 people were seriously injured on Europe’s roads in 2017, contributing to an overall socio-economic cost of €120bn (£105bn). Violeta Bulc, the EC’s commissioner for transport, said: “Road safety is of course a responsibility shared with the member states, but I believe that the EU can do more to better protect Europeans.